It's time for my annual birthday/Christmas wishlist and the two being so close together it means I can just do one chunky wishlist! I've fought with myself over the idea of writing this post because I know my family come and have a look at this and I kinda feel bad writing it knowing that. But I hate to break my blogging tradition of writing this post so it's up a little later than I'd normally post it on purpose! Anyway, onto what's on my wishlist this year and why. I'm really into anything cosy and relaxing this year. I haven't got huge things on my wishlist because there's nothing big that I really really want this year. In fact, a lot of the things I do want this year are things that reflect my personality, could belong in my future home or are to replace things that are worn down or that I don't have anymore. Right now my interests are anything to do with cacti, Harry Potter and bobble hats (for some reason) are an obsession. I'm a bit chatty so I'm always quite obvious with what I like and I make it known without meaning to. I don't know why, but I really go all out when I like something! Recently I've noticed a boom in the cactus trend. Everything seems covered in cacti and it's fulfilling my thing for them. A bunch of cacti mugs and that cosy blanket please! The other day I also noticed that my beauty case was falling apart. It was a gift that I've had for years and after getting a cut from the broken metal, I decided it's probably time for a new one. I'd love a big one like the one I have now. Oh, and some new brushes to replace some tatty old ones that I could put in the case too would be nice! There's not a lot of beauty I'm after this year and to be honest, I don't need it so I'm all good for that right now. Other things that could do with replacing are some boots and coats. I need a couple of coats and I'd love a new fur coat for the weekend and maybe a parka for my work days. I'm also really into the boots out this year and I'd like a couple of interesting pairs to jazz up my wardrobe. Over the knees and embroidered boots are my favourite right now. I love these over-the-knee black ones at the moment but I'm also liking some grey ones that are about too. Being a teacher, with me, you can't go wrong with some stationery. I think I'm good for notebooks but I'm always in need of a pen. It doesn't have to be one of those super expensive parker pens but I like these ones from Paperchase. I'm always buying the £3 mechanical ones. They write so nicely and last for ages! I'm craving a bath at the moment so Lush gift sets are definitely on my wishlist. I plan on having a few baths this Christmas time and I'd love to try some of the new bath bombs Lush have out at the moment. Their boxes are amazing value for money and I love giving them as gifts too. 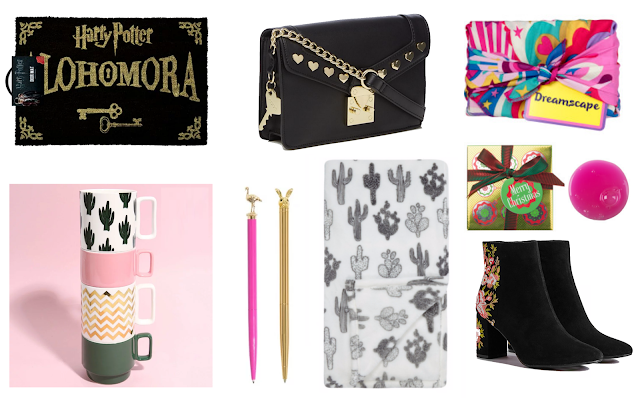 So yeah.... that's my wishlist for this year! I don't think it's too crazy and I think it represents me quite well. 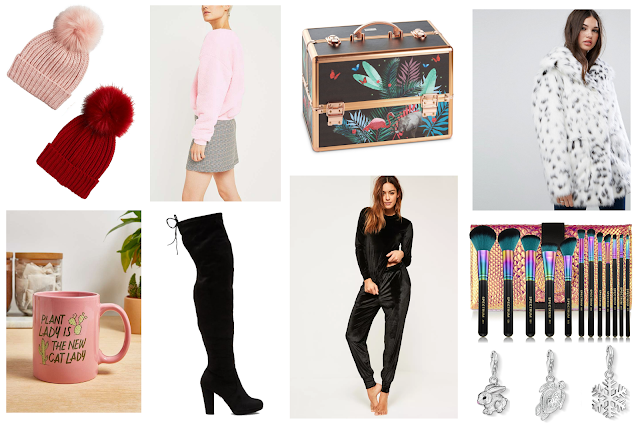 Saving for a house means I'm looking to get some things for my future home so any homeware is definitely on my wishlists too. What's on your Christmas wishlist this year?